How is lauric acid used by our body? The human body converts lauric acid into monolaurin which is claimed to help in dealing with viruses and bacteria causing diseases such as herpes, influenza, cytomegalovirus, and even HIV. It helps in fighting harmful bacteria such as listeria monocytogenes and helicobacter pylori, and harmful protozoa such as giardia lamblia. As a result of these various health benefits of coconut oil, though its exact mechanism of action was unknown, it has been extensively used in Ayurveda, the traditional Indian medicinal system. The Coconut Research Center has compiled various benefits in both traditional and modern medicine. monounsaturated fatty acids and polyunsaturated fatty acids. Virgin coconut oil is no different from this. Let us have a bit detailed study of this.. Hair care: Coconut oil is one of the best natural nutrition for hair. It helps in healthy growth of hair providing them a shiny complexion. It is effective in reducing the protein loss for damaged and undamaged hair. Skin care Coconut oil is excellent massage oil for the skin as well. It acts as an effective moisturizer on all types of skins including dry skin. The benefit of coconut oil on the skin is comparable to that of mineral oil. Further, unlike mineral oil, there is no chance of having any adverse side effects on the skin with the application of coconut oil. Coconut oil therefore is a safe solution for preventing dryness and flaking of skin. It also delays wrinkles, and sagging of skin which normally become prominent with age. Coconut oil also helps in treating various skin problems including psoriasis, dermatitis, eczema and other skin infections. Therefore coconut oil forms the basic ingredient of various body care products such as soaps, lotions, creams, etc., used for skin care. Coconut oil also helps in preventing premature aging and degenerative diseases due to its antioxidant properties. 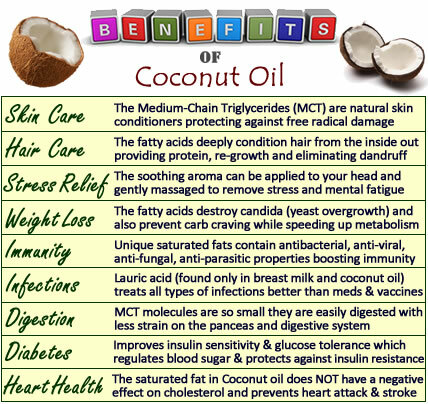 Heart diseases There is a misconception spread among many people that coconut oil is not good for the heart. This is because it contains a large quantity of saturated fats. However, coconut oil is beneficial for the heart. It contains about 50% lauric acid, which helps in preventing various heart problems including high cholesterol levels and high blood pressure. The saturated fats present in coconut oil are not harmful as it happens in case of other vegetables oils. It does not lead to increase in LDL levels. It also reduces the incidence of injury in arteries and therefore helps in preventing atherosclerosis. Weight loss Coconut oil is very useful in reducing weight. It contains short and medium-chain fatty acids that help in taking off excessive weight. It is also easy to digest and it helps in healthy functioning of the thyroid and enzymes systems. Further, it increases the body metabolism by removing stress on pancreases, thereby burning out more energy and helping obese and overweight people reduce their weight. Hence, people living in tropical coastal areas, who eat coconut oil daily as their primary cooking oil, are normally not fat, obese or overweight. Digestion Internal use of coconut oil occurs primarily as cooking oil. Coconut oil helps in improving the digestive system and thus prevents various stomach and digestion related problems including irritable bowel syndrome. The saturated fats present in coconut oil have antimicrobial properties and help in dealing with various bacteria, fungi, parasites, etc., that cause indigestion. Coconut oil also helps in absorption of other nutrients such as vitamins, minerals and amino acids. Immunity Coconut oil is also good for the immune system. It strengthens the immune system as it contains antimicrobial lipids, lauric acid, capric acid and caprylic acid which have antifungal, antibacterial and antiviral properties. The human body converts lauric acid into monolaurin which is claimed to help in dealing with viruses and bacteria causing diseases such as herpes, influenza, cytomegalovirus, and even HIV. It helps in fighting harmful bacteria such as listeria monocytogenes and helicobacter pylori, and harmful protozoa such as giardia lamblia. Candida Coconut is beneficial in preventing and curing candida. It provides relief from the inflammation caused by candida, externally and internally. Its high moisture retaining capacity does not let the skin crack or peel off. Further, unlike other drugs for candida, the effects of coconut oil is gradual and not drastic or sudden, which gives the patient ample time to cope up with the die-off symptoms or Herxheimer Reactions (the name given to the symptoms accompanying body’s rejection of toxins generated during elimination of these fungi). But, this is one condition that you systematically and gradually increase your dosages of coconut oil and do not start with a large quantity all of a sudden. Healing and infections When applied on infections, it forms a chemical layer which protects the infected body part from external dust, air, fungi, bacteria and virus. Coconut oil is most effective on bruises as it speeds up the healing process by repairing damaged tissues. Why is coconut oil solid? : Unlike most other oils, coconut oil has a high melting point — about 24 to 25 degress Celsius or 76-78 Fahrenheit. Therefore it is solid at room temperature and melts only when the temperatures go high. Hence, if you buy a bottle of coconut oil and find it solid, don’t think that there is some problem with it. Coconut oil is like this only. And of course, don’t keep it in your refrigerator. Varieties of Coconut Oil There are primarily 6 varieties of coconut oil that you will find in the market. These are pure coconut oil, refined coconut oil, organic coconut oil, virgin coconut oil, organic virgin coconut oil and extra virgin coconut oil. Coconut oil extraction Cold pressing is one of the preferred methods of extraction of coconut oil.The quality and goodness of coconut oil depends much on the method of its extraction. 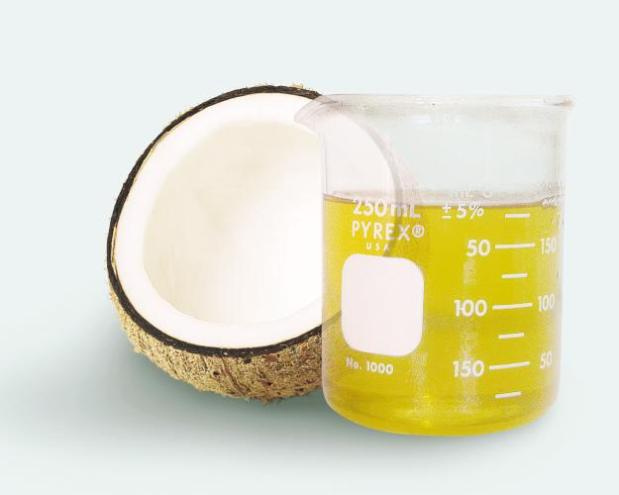 Basically, there are two main methods of extraction of coconut oil. First one is cold pressing of copra (dried coconut kernels) and the second is boiling of fresh coconut milk. Since boiling or heating destroys many nutrients and volatile components, hence coconut oil obtained this way is not considered as good as that obtained by cold pressing, as cold pressing retains much of oil’s goodness. Machine pressing and bullock/manual pressing are two methods of cold pressing. Buying Coconut Oil First of all, you need to decide why you need coconut oil, i.e. where you are going to use it. Your choice should be based on your need, i.e. whether you want it for edible purposes or as a carrier oil to be used in aromatherapy or for massaging or for weight loss or for medicinal purposes etc. As mentioned earlier there are different varieties for different purposes. Their properties do not differ much, unless they are mixed with some base or additives and do not contain 100% coconut oil. Given below is a list of such purposes and the type of coconut oil to buy. Which brand to buy? : No problem if someone in your village extracts coconut oil (quite normal in Philippines, Thailand, Burma, coastal India, Sri Lanka etc.) and you know that person well or see him/her expelling the oil. But when you are to buy coconut oil in packs, go for the reliable and reputed brands. Read the contents carefully. Watch he manufacturing date (although coconut oil has a long shelf life, still, the fresher the better).